A vicar from Lancashire is making final preparations before he becomes rector of the Falkland Islands. Reverend Paul Sweeting will also become the priest in charge of the island's Christ Church Cathedral at the end of his 8,000 mile journey. Mr Sweeting, who is leaving his post at St Gabriel's Church in Blackburn, took his last service in the UK last month. He and his family have spent the last few weeks preparing for the change in lifestyle after an advert for the job was first spotted by Mr Sweeting's wife Maxine. On Sunday he told BBC Radio Lancashire it will be a big change, but it is the right move to be making. Mr Sweeting and his wife have two young children, Jonathan and Adam, and he said the whole family is looking forward to the move. Speaking about the appointment at the time, Mr Sweeting said: "It's a gift for our children because they love wildlife." He said he would miss parishioners in Blackburn and said some were shocked about his decision to leave. "It's nothing against Blackburn, but it is about as far away as you can get from the town," he added. 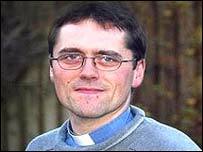 Mr Sweeting will replace Reverend Alistair McHaffie at the cathedral, which was first built in Port Stanley in 1892. He was appointed by the then Archbishop of Canterbury Dr George Carey in November last year.